Scenic and projection design. The boat ride from Depression-era New York to the unknown depths of Skull Island involves a tilted platform against a brilliant backdrop of ocean waves, a night sky, and lightning in the distance. It is so realistic that you better have Dramamine on hand for the seasickness that will ensue. 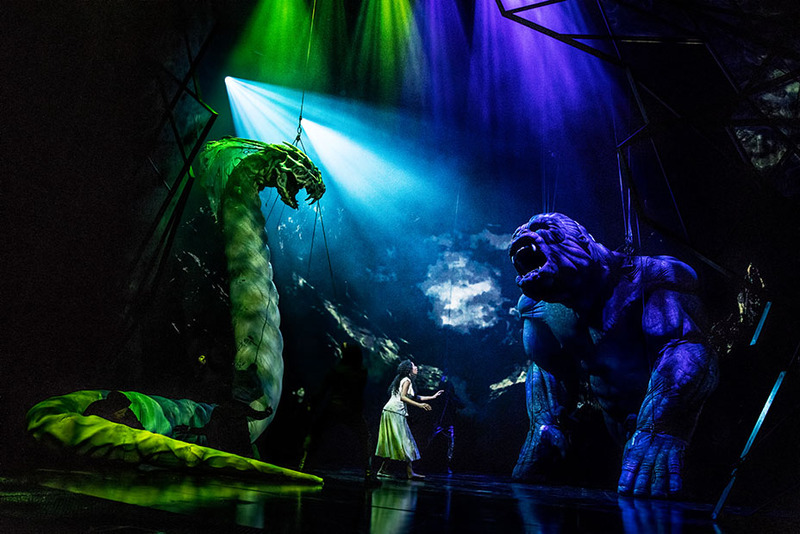 Skull Island’s strobe lights, ivy-covered cave-dwellers, a shattering moonscape, giant spiderwebs…the video acting in tandem with the spectacular set pieces is ground-breaking. 2. Heart-pounding moments of anticipation. Just try not to hear your own heart beating in the thrillingly silent thirty seconds leading up to Kong’s entrance. With Ann Darrow hanging mid-air entwined in a mess of vines, Kong’s footsteps reverberating as he advances towards his “prey,” and his loud snorts intermittently shaking the air at the Broadway Theatre, it is difficult to remember that you are only taking in a show. Kong’s anger-induced chase through the jungle, his ultimate aerial demise atop the Empire State Building, and his escape from captivity are enthralling. 3. Sound design. Ever wonder what it is like to have a 20-foot gorilla breathing down the back of your shirt? Wonder no more. Though you could compare his enormity to what one would experience at the Universal Studios attraction of yesteryear, Kong’s “voice,” ie., his snorts, growls, roars, etc., are piercing and intimate to chilling effect in a Broadway theatre. 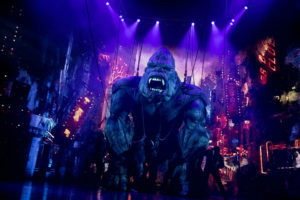 When Kong is breaking through his shackles, wreaking violent havoc behind the stage curtain, the show runs the risk of being gimmicky; however, due to Peter Hylenski’s gripping sound design, King Kong is as suspenseful as it is scary. 4. King Kong and his company. The “company” is an amazing troupe of performers whose sole role in the show is to maneuver the animatronic ape. They move with stunning fluidity and acrobatics that is an unbelievable form of choreography in and of itself. Every nuance of the incredibly detailed creature, from the twitch of his nose to the slouch of his shoulders, is precisely timed and impactful, thanks to Kong/Aerial Movement Director Gavin Robins and Creature Designer Sonny Tilders, sixteen microprocessors, and their teams of artists. Kong is even extraordinary visually sans movement. His multitude of veins and muscles are exquisitely detailed on his enormous body, by far surpassing any other “puppet” audiences have seen previously. The wrinkles on his face are so intricate that they tell their own story. 5. The “I was there” factor. 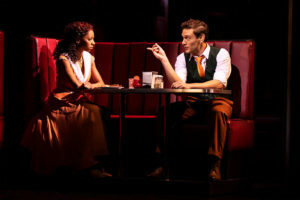 Whether it’s to marvel in the show’s enormity, to wax poetic on the atrocity of the music, lyrics and/or book, or to experience ground-breaking technology on the Broadway stage, being in Kong’s grasp definitely allows for fun conversations, critiquing of the highest order, and possibly even bragging rights….